Conventional wisdom dictates that small states should lack the ability to significantly affect the international behavior of superpowers; however, the small island nation of Jamaica has shown itself unusually capable of influencing some aspects of United States foreign policy. In his new book The Influence of Small States on Superpowers: Jamaica and U.S. Foreign Policy (Lanham: Lexington Publishers, June, 2015, https://Rowman.com/Lexington), Ambassador Richard Bernal explores this theme in detail, helping to address the question of how we should view the asymmetric influence of small states on global affairs. 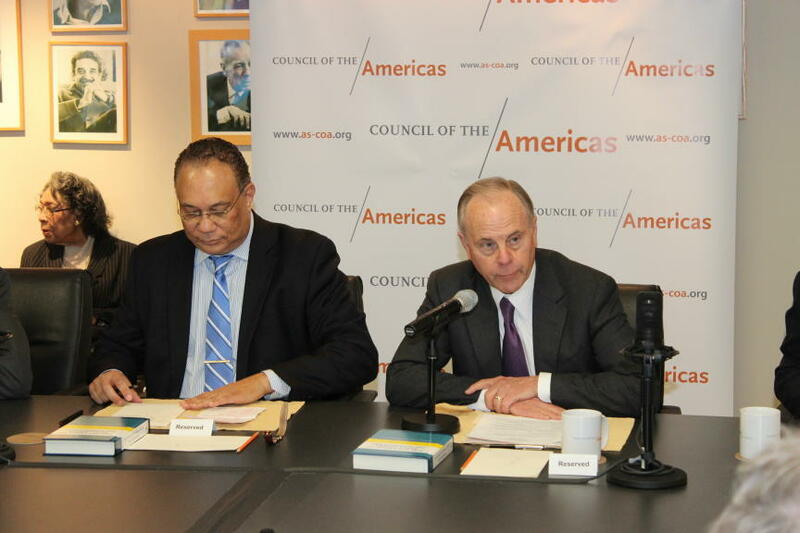 During a November 20th panel hosted by the Council of the Americas in Washington, Ambassador Bernal was joined by Thomas “Mack” McLarty, the Chairman of McLarty Associates, and Sir George Alleyne, the former Chancellor of the University of the West Indies, in an official launch of his latest book. Drawing on his decades of experience as a leading Jamaican diplomat and economist in Washington and Kingston, Ambassador Bernal offers well-informed assessments of the challenges confronting small nations seeking to attract favorable attention in Washington’s policy-making, think-tank, and media communities. In his introduction to the panel Mr. McLarty praised Ambassador Bernal’s nuanced understanding of how Washington works; Bernal successfully used every avenue available to mobilize support for Jamaica and its interests. McLarty noted that small states like Jamaica face significant challenges in securing the active engagement of Washington’s decision-makers. Ambassador Bernal discussed three big policy challenges during his tenure as Jamaica’s Ambassador to the United States: (1) the granting of significant debt relief during the financial crisis of early 1980s; (2) U.S. certification of Jamaica’s performance in terms of counternarcotics cooperation through the 1980s; and (3) the successful efforts with the US Congress and the Reagan and Bush Administration to upgrade Jamaica’s status within the Caribbean Basin Initiative and other trade legislation. In each of these cases, Ambassador Bernal noted that it was critical to develop strategic alliances with the private sector, both political parties in Congress, think-tanks, the media, and well-placed friends of Jamaica across American society so as to promote Jamaica’s interests. 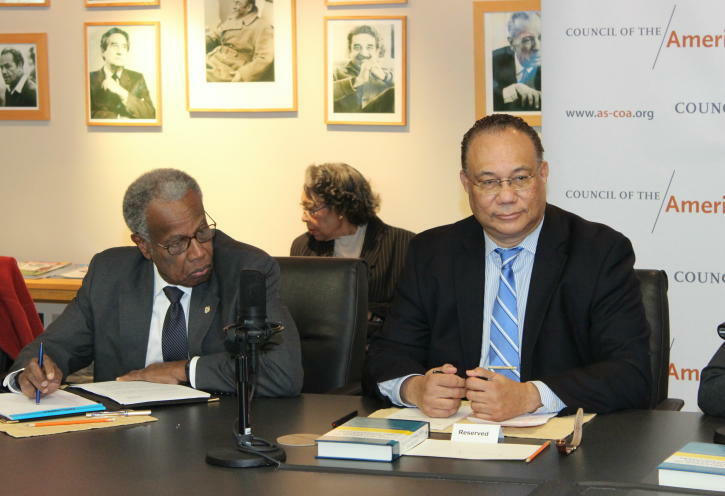 Sir George Alleyne cited his own experiences as the first Caribbean head of the Pan American Health Organization (PAHO) as relevant to the themes addressed in the Bernal book. It was always important to focus lobbying efforts on the “mutuality of interests” that exists between small states like Jamaica and large states like the U.S. as well as the “exceptionalism” of states like Jamaica which possess a unique cultural heritage and strong traditions in sport and the arts. Caribbean-American television broadcaster Maureen Bunyan noted the influence of the Jamaican diaspora in the United States, and Ambassador Bernal recognized the positive impact of the Jamaican diaspora in fostering a closer relationship between the United States and Jamaica.